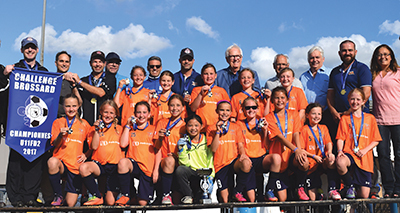 The 2006 Girls U11 Orangeville Storm soccer team travelled to Montreal, Quebec over the August long weekend to participate in the 32nd edition of the Challenge Brossard. The tournament is the largest international soccer event in the province, and provided the team with its first opportunity to compete for a trophy since turning rep in 2014. The girls were hoping to follow in the footsteps of the 2005 Orangeville Storm girls team, who last year became the first OMSC team to win at Brossard. The weekend started off with games against Darlington and FC Durham Academy on the Saturday afternoon. The Storm girls started quickly against Darlington, with Melinda Mattine opening the scoring five minutes into the game. Melinda added another later in the match, as well as a three goal performance from Charlotte Cuthbertson. Taylore Hogenhout ended the game with her first of the tournament four minutes into the second half, as Orangeville opened up the six goal lead, which was the tournament mercy limit. The Storm faced stiffer opposition in game two on Saturday, but a successful penalty kick from Bridget Beckett in the first half was all the scoring Orangeville would require against FC Durham Academy. Sydney Bentley added an insurance marker late in the second half, and the girls were off to a 2-0 start to the tournament. An early 8:00 a.m. match on Sunday morning in windy conditions saw Orangeville face their first deficit of the tournament, falling behind 1-0 to Barrie two minutes into the game. The Storm girls evened the game at one apiece with the third strike of the tournament from Melinda Mattine. Abby Lemesurier lobbed a perfect ball over the Barrie keeper for the lead at the end of the first half, and Cuthberston scored her team leading fourth goal of the tournament to send Orangeville through as the top seed in the pool. In the semi-final with Mount Hamilton, Hogenhout opened the scoring on a beautiful rocket past the Mount Hamilton keeper in the first half. The Storm recorded four penalty shot goals in the game, again from Taylore Hogenhout, followed by Cuthbertson, Bentley and Olivia Chung. Up against the Picker Gold in the final, Orangeville struck quickly with Bridget Beckett blasting home a thundering shot into the far corner for an early lead. Cuthbertson scored her team leading sixth goal of the tournament on a beautiful feed from fellow striker Abbey Spiteri for a two goal cushion. Pickering pressed hard, and fantastic goalkeeping from Avery Donnelly kept their speedy attack at bay. Pickering scored in the second half to make for a tense final few moments, but the Storm held on to win the game 2-1 and were crowned as the U11F D2 Championship. The coaching staff were ecstatic about the efforts and contributions of all the players. The attack benefitted from consistent ball distribution from players such as Keira Broom and midfield runs from Kendra Divers and Megan Smith throughout the tournament while solid defending from the likes of Chung, Kaitlyn Stevens, Mikki Sproule and Claire VanNiejenhuis led Orangeville to the best goal differential in the division.